I’m standing in the hallway of a house party, having failed to penetrate any further. Still holding my coat and without a drink in hand, I reel off what is becoming a well rehearsed explanation. My eyes drift past the friendly chap making small talk and survey the scene. The Community surrounding the Royal Cornwall Hospital where we work is an interesting mix of staff and students. Far out west, there is a cut-off and intimate feel to the place. Pick up the telephone to make a referral and the odds are you’ll speak with somebody you recently saw in the pub or out surfing. A walk down a corridor usually entails a series of meetings and greetings. Everyone knows each others business. 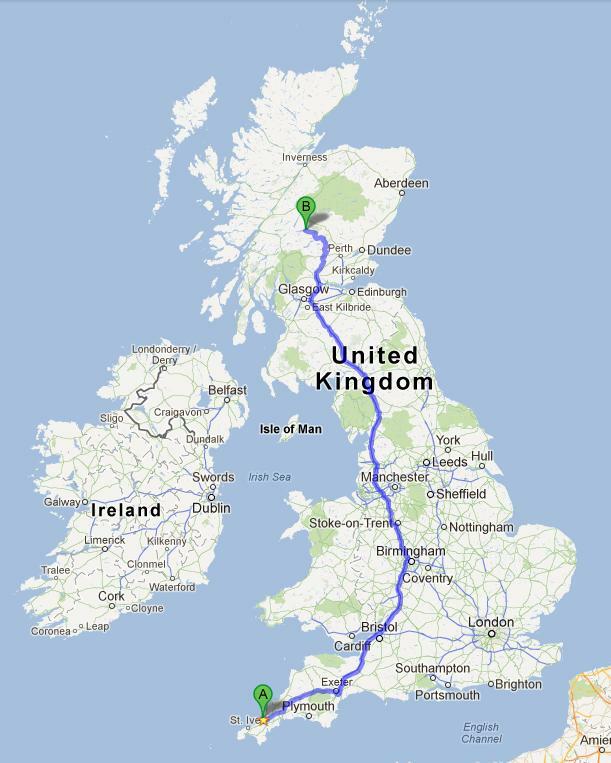 Rich, Dan and I are known as the boys planning ‘that huge trip to Africa’. This has been reinforced by the fact we’ve been bouncing around Cornwall for the past month in an intimidating long wheel-based 110 Land Rover Defender with raised suspension and a custom roof rack. It looks like it eats other cars. Responses to my now reflexive explanation can be broadly classified into anxiety and envy. People either say we’re mad or express their wish to do a similar thing. 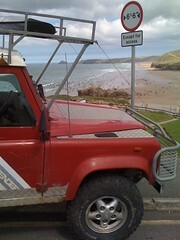 Cornwall probably has a higher proportion of the adventuring sort. “Um, I think firearms might cause more problems than they solve,” I suggest. I edge further into the party. This enthusiastic envy gets me thinking. What is it specifically about this project that catches people’s imagination? The journey seems fraught with back to back problems or ‘challenges’ as the optimistic call them. There is certainty of discomfort, boredom, disagreement, mechanical failures, crippling beaurocracy, risks to our personal safety and a thousand other ‘challenges’ we have yet to identify. A cynic would say that an adventure is a holiday with a series of problems. Surely a year long holiday should earn greater envy? I think it boils down to human nature and the way we are wired. Adventure gives purpose. Becoming totally immersed in overcoming these daily challenges, adapting and changing the plans, gaining new experiences and stories along the way, all the while with a cause in sight, is the fundamental appeal. Dan pranced downstairs one evening, fiery-eyed (as he can be, whether he’s raging against life’s deep injustices or denouncing cheap tea). I think he had just finished Conrad’s Heart of Darkness and it had clearly made an impression, as many a book does. “I think we should all go through Africa together,” he pronounced, gesturing to a convenient map on the wall. Of all the chance journeys an e-Bay purchase could have taken us upon, I cannot envisage a stranger encounter. 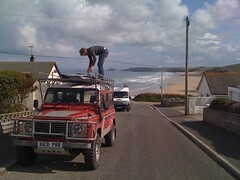 On that particular day we decided to look for a Land Rover, we found one that we knew we had to have. 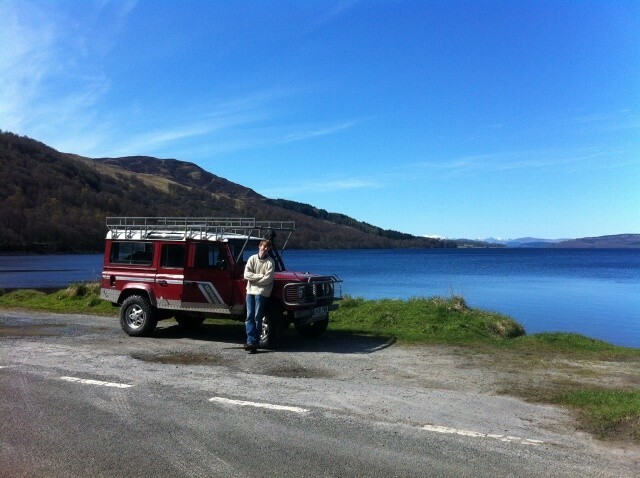 It was a fine red 20 year-old, fully kitted out Defender that we believed would withstand the ravages of Africa. There were two snags: 1. It was far up on Rannoch moor in the Highlands of Scotland. 2. It was already sold. A phone call solved the second problem. The owner on the other end of the line was a man a talkative man called Malcolm. One of his sons had put the car on e-Bay but it had sold for far below what he wanted for it. We’re unsure as to how he got out of the deal but he was keen to sell to us. We established a good rapport with this enthusiastic Cornishman who, for some reason was residing up in a vast Scottish wilderness. His asking price seemed reasonable so we arranged to fly up and ‘have a look at the car’. Dan, Rich, Guy and I flew up on one weekend in early spring in a small aircraft from Newquay to Glasgow. Arriving on Saturday afternoon, the plan was to hire a car and drive into the Scottish wilderness, get the car and drive it back to Cornwall in time for work on Monday. This was almost scuppered by a hire car administration error, leaving us stranded in the airport. Fortunately we were rescued by a kindly sole from another company, who arranged for us to borrow one of their cars. 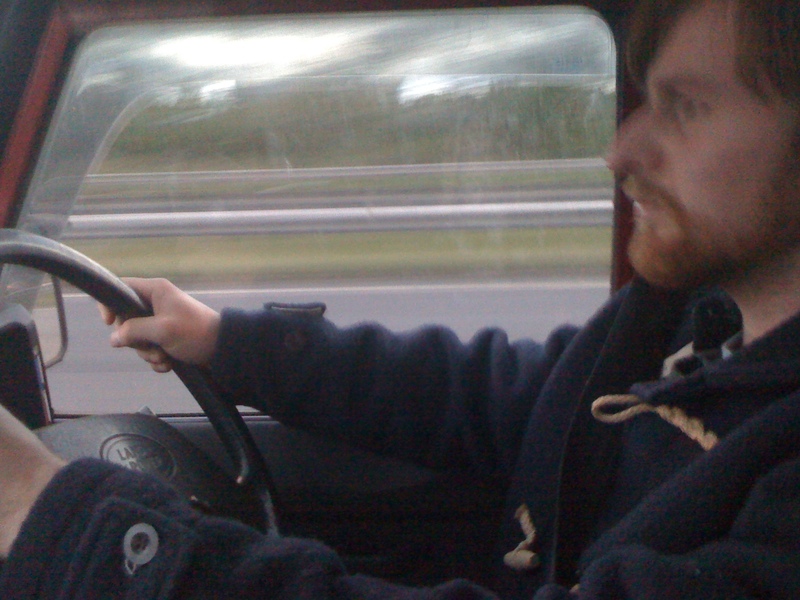 We drove through Scotland in the golden evening light, racing past castle and loch, making good time. Eventually we turned off the main road and began to wind our way into the highland. As the light faded and the deer to human ratio shifted strongly in the favour of the latter, we began to appreciate how isolated our destination was. It was a starry dark as we reached the end of the drive. Although we could no longer see the snow-tipped horizon, there was a feeling of vast and blackened highland above us. We looked up at a turreted castle. After a period of staring at this lofty clan stronghold, we knocked on the door. Behind a threshold that had probably withstood a clan feud or two, a bearded face with a cautious smile appeared. Hands were shaken and we ushered through into a panelled hallway, festooned with hunting trophies. Monarchic antlers interspersed the heads of big African game looking down in anger or surprise. In the grand living room, under more trophies, we were offered a whiskey. We hadn’t eaten for most of the day but there was a sharp chill in the air that our mild Cornish blood wasn’t used to. Malcolm was a Cornish man who had made his fortuned in ‘speculating’’ as he called it. He was living up on Rannoch moor with his wife and eight children and had a very ‘opt out’ approach to society. When he had bought the place several years ago, it had been a school. We stayed that night in one of the old teacher’s houses and awoke at crack of dawn to a cloudless spring morning. There were deer on the lawn and the air was thick with birdsong, running water and nothing else. The plan had been to set off bright and early after the purchase as we all had work the following morning at the other end of the country. However we were unable to resist the surroundings and spent the day exploring by foot and Landrover as well as having a celebratory bottle of champagne in the sun. It was half seven when we finally returned our rental car to Glasgow and crossed the border. The weather was closing in and the sky was bruising. The following Nine ours stand out as a surreal and desperate string of service station stops and driving shifts in non-stop driving rain. An overland trip to South Africa has been a pipe dream for us for quite some time; with an career break* on the horizon, what better time to give it a go before family, a mortgage, and “real life” take over? We quickly realised that a big dream becomes a Sisyphean task; something which it would be easy to put off indefinitely. We needed something to cement the concept, to force us to invest in the project. We needed a vehicle. Many animated conversations ensued over pints of Betty Stoggs, but in the end there was only one conclusion. It had to be a Land Rover. As it turns out, you actually pay quite a lot for an old Landie. 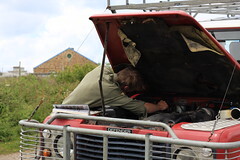 We quickly found that our budget limited us to a minimum age of 15 years, a high likelihood of some holey bodywork, and an engine with at least 100,000 miles under its belt (‘just worn in’ is how most Land Rover boffins describe this land mark – we’re not convinced).